This site has been created so people can have a place to comment on developments in the talks between the Federation of Gay Games and the Gay & Lesbian International Sports Association and voice our concerns that the Gay Games keep focused on their sports mission. We will also attempt to archive relative background documents so people can be informed on the background of the talks, the history of the relevant events, and the main players in negotiations. So, please enjoy and share. And see you all in Paris in 2018! The observations are correct about the declines in numbers for both Gay Games and World OutGames, and it is happening to all event LGBT events, not just our LGBT multisport events. Only Sin City ShootOut is growing rapidly because of its simplicity: low costs, diversity, and 100% sports focus. It has equaled Gay Games 2014 and surpassed all World OutGames in registration. . It is not the FGG/GLISA split that is the cause of their numbers decline. The split has been a convenient political scapegoat, nobody really knows why there is split, and nobody really cares either. They just want to PLAY SPORTS. One Word Event (1WE) is a nice catch all feel good sound bite phrase invoked emotionally (I call it kumbaya for lack of a better term) that really does not solve anything, and has some very negative consequences (cf: below under IMPLICATIONS). As a community organizer who is very interested in sports and talks to competitors all the time in our Team San Francisco sports organizations, I can offer an analysis with gravitas: Team San Francisco has always been one of the largest contingents to a Gay Games. It is where the Games began, and it served as the incubator for a lot of other much larger LGBT sports groups like IGLA, IGBO, etc.. etc.. going back to 1982. I have been there from the beginning as a founding member of Team San Francisco. There is a LOT of very intelligent favorable LGBT financial and corporate power here in the San Francisco area that can be tapped if we are very careful with our Gay Games Brand & Mission management. These people have also been here through this entire 30 years of LGBT Human Right struggle, and are not going to be easily fooled. 1. We are victims of our own success in the progressive areas of the world. Out LGBT athletes have far more options now as they mainstream and prove themselves. There is lots of data out there like with Athlete Ally, NIKE Coalition, etc.. that proves this. However this is not true in the rest of the world where Gay Games is needed. In San Francisco, IAGLMA, WWB, IGLA, IGLFA, IGBO etc… are far bigger/richer than Team San Francisco. So we need to refocus ourselves on common Mission around our more powerful LGBT sports organization partners. They all have 501c3 non-profit status, $$, and are sports focused. 2. The financial disparities around the world for our LGBT communities have progressively exacerbated in the past 20 years.. This has put pressure on the FGG and GLISA to address it through scholarship programs and distributed events like Continental Games. These are not mutually exclusive strategies, but inadequate. We have all the registration databases from 1994 Gay Games through 2010. I have done extensive analysis while I was FGG Technology that I have forwarded repeatedly to the FGG Board and the current Hosts going back to Amsterdam 1998…. i.e…. who went where when and if there was a pattern. I do not have Cleveland’s #s to analyze, and GLISA simply does not supply that level of detail for their events ( I had to interpret/infer from their sports results if there is one). I would recommend that interested people especially contact the event & marketing people of Sydney, Chicago, and Cologne who received this information as well as use of the database…. E.g… Rob Smitherman who I worked closely with me in Chicago, Cologne, and Cleveland (2006-1014). 1. LAG: It is not a 4 year quadrennial lag, it is 8 years because of the geographical location issue that adds ~$3-4k to the cost of attending depending where you live. Many of our target ‘Mission’ areas in the more remote regions of the world who really need the event, are simply excluded by finances. An 8 year hiatus to make connections is simply too little too late. This observation is reproducible by studying the rationals of IGLA, IGLFA, and the Bingham Cup (to name just 3 large events) to rotate their event around the oceans of the world. The FGG site selection has an implicit tendency to balance this as well, while GLISA’s WOGs site selection process much less so as it is not as public. 2. Lack of Sport Diversity: The GLISA continental Games have been the most successful ‘Mission’ events in the outlying parts of the world, especially GLISA-AP (Asia Pacific). While certainly not on the scale of a Gay Games, they do create interest, buzz, connection, and motivation… It gives hope where it is needed.. However in sports, especially many smaller sport, GLISA has no expertise. So the LGBT sports organizations like IAGLMA and WWB have stepped up and created those connections so they can co-exist in GLISA-AP. The Aussies wrestlers are a perfect example of a vibrant growing younger group that needed connection, and gave the ‘Movement’ and ‘Mission’ greater outreach & visibility. 3. The Efficacy of Conferences as a 1/3 Resource: Past surveys of Gay Games registrants have made it clear that they have no time for conferences in a packed Gay Games schedule like VolleyBall, Aquatics, and Soccer. We have done surveys and took 2 hours discussing it an FGG Annual Meeting in Cologne coming to the same conclusion. That does not mean they should not be included, as they serve a purpose for getting VISAs from unfriendly countries, can attract some registrants, getting sponsors lie a Walgreens, and it is an added event for those who are not competing. But they really are not as important to be deserving a 1/3 of focus and resources in say Antwerp as they are in say Johannesburg ZA. The objection is that as we become more successful as a community, many of our LGBT athletes will simply choose the mainstream competition options, and that damages the critical mass of the quadrennial as well the as the ‘Image’ of the event as an athletic event. It is already happening, and it has consequences. It hurts the bottom line because another Gay Pride + Conferences + some larger sports will not be as attractive to our Athletic/Games community registrants as a traditional Gay Games with its broader range and diversity of sport options. You only need to study the trend in PRIDE festivals worldwide to understand that Gay Games is very unique, and should not enter this glutted PRIDE and Conference market. It IS the SPORTS , Damn It (as Roger Brigham wrote in his Bay Area Reporter column). 1. More Frequent, More Affordable, Smaller Scope, More Diverse, More Distributed Events: I am reminded of the parting words of 1994 Gay Games IV operations directors Roz Quarto & Steve Mumby (paraphrasing): “The scope of 30 sports was too big for any host to accomplish the Mission”. Since that time, people like Stuart Borrie and Rob Smitherman (Gay Games operation directors for Sydney and Chicago/Cleveland) have said similar things. In order to service our Mission properly, we need to engage our target peoples at least every 2 years with an event like a Gay Games and a World OutGames leveraging their people and their strengths. We do not need to reinvent the wheel to do this…. Control of LGBT sports calendar and SHARING resources will do it very nicely. 2. Preserving Brand & Mission: In order to accomplish #1 above, we will need resources.. Human volunteer resources with the expertise/ability to technically do this, and financial resources to pay for it. Well first off that means we stop this ageist dismissing of older leadership as useless cogs, when they have the experience, skill sets, and RESOURCES to do this. Forcing this unified event to abandon the Gay Games Brand and Mission will probably cost the FGG about ~$2mil (my most recent estimates from legacy people/HLMs). What will happen to sponsorship opportunities then with a new Brand/Mission yet to be defined to be in place by 2022? In the next 5-20 years, a lot of that FGG San Francisco bequeathal $$ will become available (like Laura Moore’s scholarship directed bequeathal), and is perfect for leveraging to support this ‘Mission’ we all share. Should we just write it all off because of silly political disagreements about whose quadrennial event is bigger? We already know that answer, and so what, it gets us nowhere. 2022 site selection will be here before you know it without a Gay Games Brand Name & Mission, a bad signal to the HLM revising their Wills. 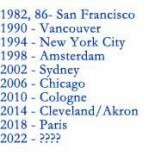 The team San Francisco Proposal deserves consideration because it reunites us all on the important stuff immediately that we all already agree on… PLUS… no more fights, no lawsuits, no loss of legacy, no loss of key people, no loss of sponsorship credibility, and most of all no loss a lot of a lot of $$. This entry was posted on May 29, 2015 by missionwrestling.